This should not exist according to mainstream scholars! One of the greatest mysteries of the Ural region in Russia are a set of 5,000-year-old petroglyphs which depict a number of ‘advanced chemical structures’. But how did ancient civilizations know about them thousands of years ago? Among the numerous mysteries found in the Ural region in Russia, there is a vast area filled with enigmatic petroglyphs located on the banks of Tagil River, Neyva River, Rezh River, Yurozan River and other nearby sites. There, on a number of rocks, the ancients depicted a number of curious figures and geometrical shapes. The fascinating petroglyphs stretch across a vast area of 800 kilometers from north to south. According to mainstream archaeologists, the intricate figures were created between 4,000 and 5,000 years ago. But the most curious thing about them isn’t their age —even though it is quite impressive— but the meaning which some of them are said to represent. Many researchers who have studied the curious petroglyphs believe they are a mixture of letters, symbols and animals, a set of ancient art known to exist in numerous rock paintings around the globe. But upon closer observation, you will notice an incredible similarity between some of the symbols to complex chemical formulas. The existence of the Ural petroglyphs has been known for hundreds of years, as they have fascinated previous generations just as they have fascinated current ones. In fact, Tsar Peter I ordered scrivener Yakov Losyov to go to the sites and make an exact copy of the petroglyphs in 1699. But not much importance was given to the petroglyphs until Russian researcher Vladimir Avinsky, Atomic, Molecular and Optical Physicist, analyzed the petroglyphs. Avinsky discovered a fascinating similarity between the 5,000-year-old petroglyphs with formulae of several advacned chemical compounds. But where did the ancients obtain this knowledge from thousands of years ago? Avinsky firmly believes that in the distant past, ancient cultures around the globe were visited by advanced extraterrestrial beings who transfer great knowledge to ‘primitive’ cultures around the planet. In the view of Dr. Avinsky, the Ural petroglyphs are depictions of complex chemical formulas depicted on rock, like chains and polygons used in organic chemistry. The mysterious zig-zag shapes, spikes, and other atypical geometrical forms were thought to be fishing nets and depictions of animals, but the archaeological community does not fully agree. However, Dr. Avinsky notes that the mysterious symbols and chains depicted in the Ural region are eerily similar to well-known chemical formulas such as that of polyethylene. But the above mentioned isn’t the only alleged chemical formula depicted in the Urals. Another figure located on the river banks resembles a honeycomb. The ancients depicted many geometric shapes where they drew hexagons and extended hexagons with a number of lines. Conventional scientists have been unable to explain their meaning. However, according to Avinsky, the so-called ‘honeycomb’ shapes are in fact depictions of chemical structures such as that of graphite. But there are other petroglyphs wich also depict a number of strange symbols, and one of them is believed to represent the chemical structure of antibiotics. Interestingly, V.I.Avinsky even showed the enigmatic Ural pictograms to a number of chemists. Many of them agreed with Avinsky that there are extremely similar to many chemical formulas. 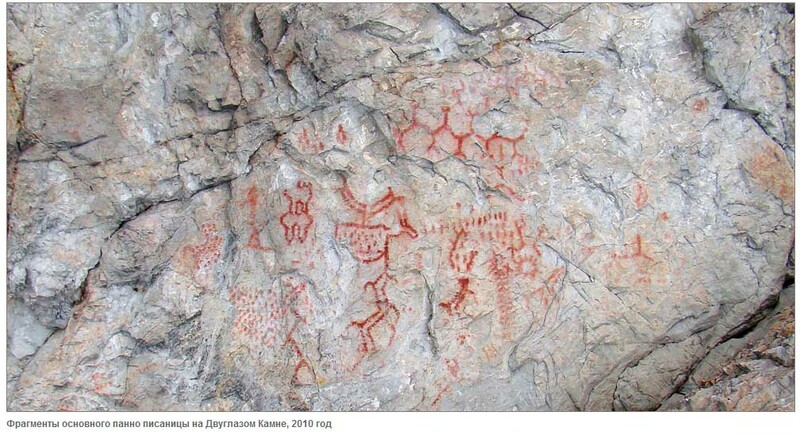 Avinsky claims that ancient people could not and should not have known this, thousands of years ago yet the petroglyphs found in the Ural region eerily resemble modern day chemical structures, and this cannot and should not be treated as a mere coincidence. How the so-called Ural pictograms came into existence has remained one of the greatest archaeological mysteries of the Ural Region. Avinsky agrees with a number of researchers that this knowledge could have been transferred to ancient civilizations by the visitors from the stars, which ancient cultures around the world claim, visited Earth in the distant past. Cross Like UFO caught near Boston USA, 2016 !